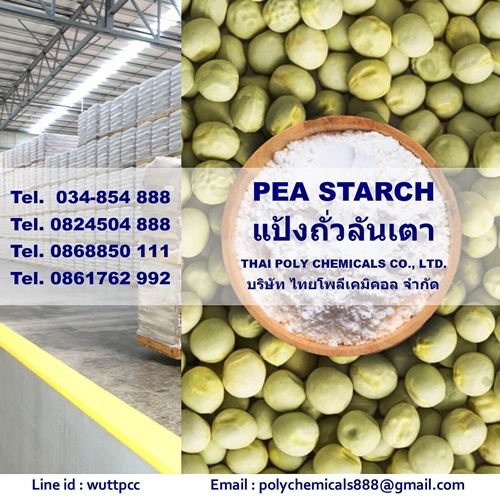 9 พฤศจิกายน 2018, 10:01:54 น.
Pea starch is a rich source of amylose (35 %) and this unique feature gives it good thickening and gelling properties which are better than other commonly used starches. Furthermore the properties of native pea starch shows e.g. higher temperature, acid as well as better shear stability. Furthermore it serves, low water binding, high gelatinization temperature, low solubility, cloudy solution–completely soluble more than 110°C, short structure, very quick gel building, very good film building properties. Pea starch can be used as binding and thickening agent with good gelling, good texture regulating as well as good expansion regulating properties in many food products, e.g. confectionary, coating, dairy, pasta and noodles, bakery products, snacks, potato products, soups & sauces, meat, poultry, fish & seafood, A unique range of pea starch ingredients. We offers high grade quality pea starch for wide food applications. These products are non-GMO, non-allergenic, gluten free and have a neutral taste. We provides its clean label pea starches that can be used as a binding and thickening agent with adjusted swelling and dissolving properties. FOOD ADDITIVE, FOOD GRADE, PLEASE CONTACT THAI POLY CHEMICALS CO., LTD.